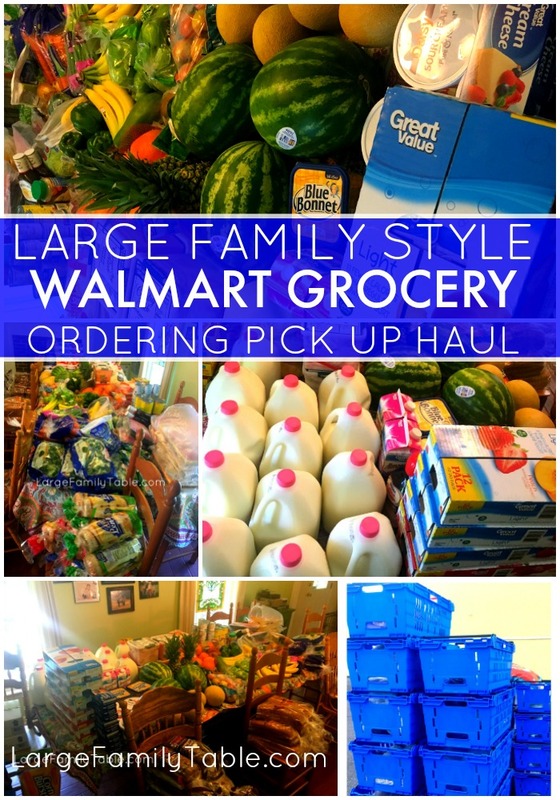 A few days ago I shared why I was trying the Walmart Online Ordering Grocery Pickup Service. I gave tips on how to place your first order and the big idea behind the service which you can read about if you’re interested. This was my first fairly true once a month grocery shopping haul in some time. The fact I could order everything we needed and have Walmart shop for it all and load it in our van (loaded in under 15-mintues I’ll add! ), was a huge part of the success of this undertaking. Again, pregnancy. Everything is super slow right now, so this is my May 2017 grocery haul and spending totals. We also spent about another $100 for fill-in items a few weeks in. This was for a 40-lb box of bananas, along with some more milk and other fruits/veggies. This brings us to a grand total of $1,037 for the month of May. 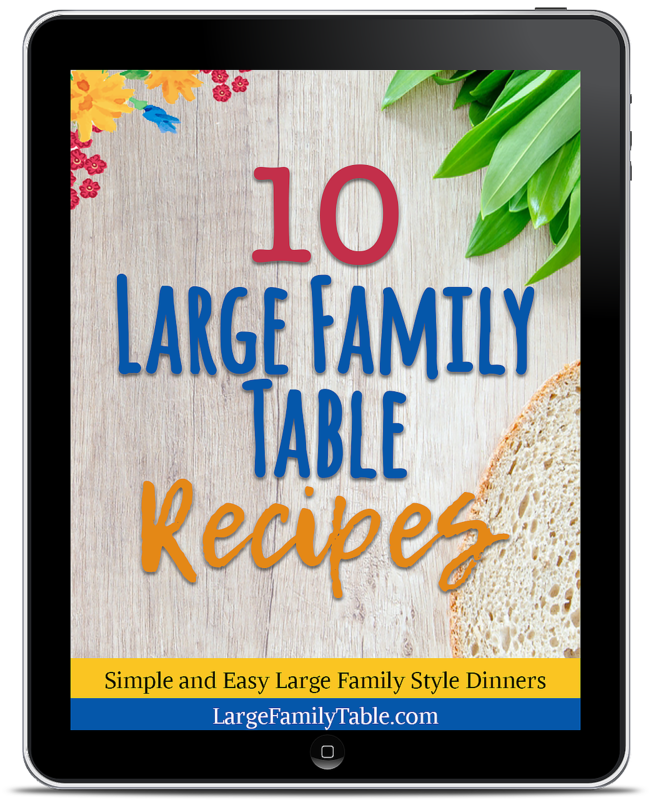 If you’re new here we’re a family of 9 including over six-foot tall teenage sons, five other kiddos ages 2, 4, 6, 8, and 10, and my husband and myself who work from home full-time and homeschool full-time. 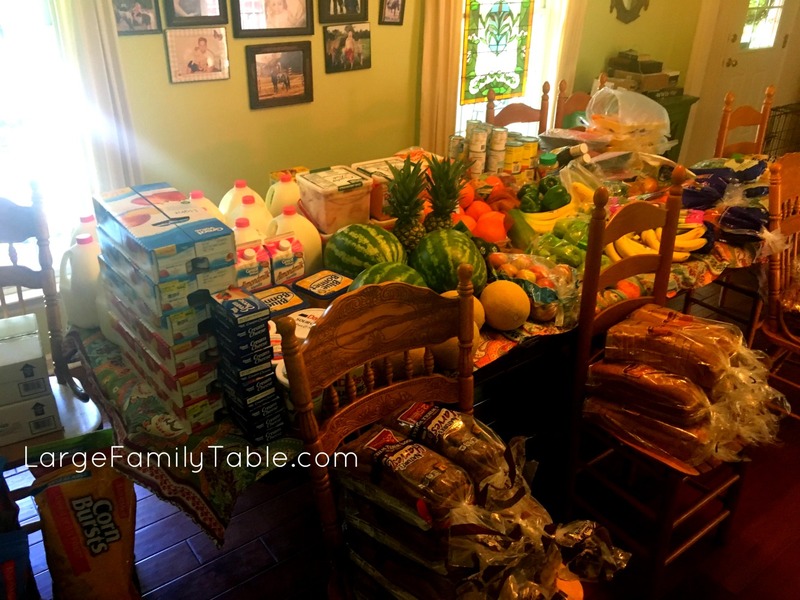 Meaning we have 90+ meals and 60+ snacks to serve up from home each month. No outside school or work lunches here. 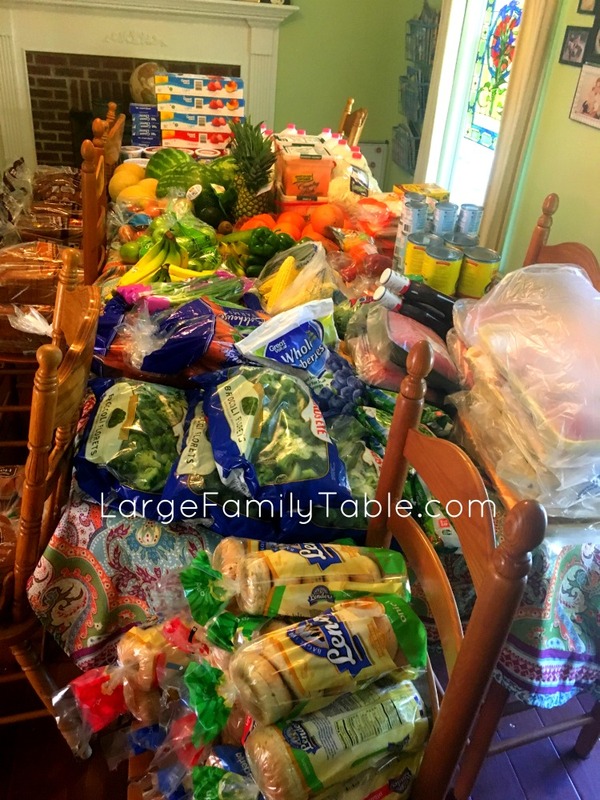 If you look through my other large family grocery hauls and even my large family grocery budget for 2015, I usually spend about $800 and another $200 on fill-in items, so I’m not too far off. I focused on items to make a ton of freezer meals to fill our new freezer as well. 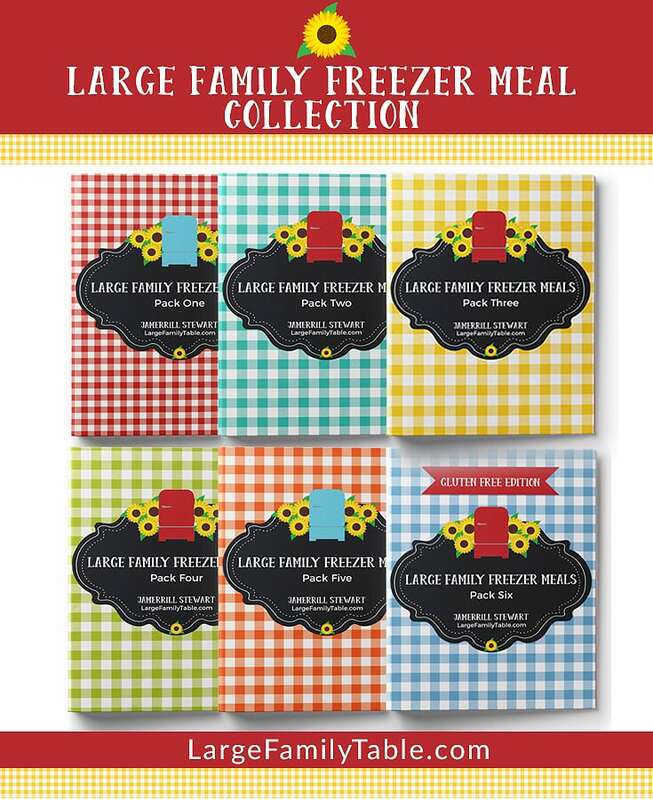 More on my updated large family freezer cooking adventures soon! Here’s the full cost breakdown of everything I bought during our first Walmart Grocery pickup haul. 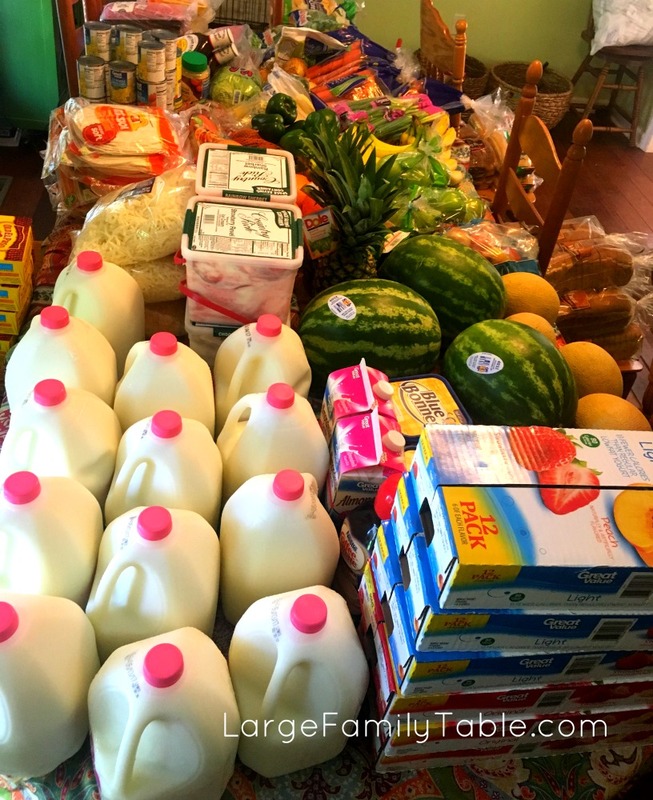 Overall the grocery pickup was a great experience. There were two or three errors, which is expected, and Walmart customer service quickly adjusted and fixed those few mistakes. Now for clarity, I don’t mix our grocery budget and household budget. I like to keep food, and toiletries/household items separate, so I know what I’m actually spending on food and all the other stuff. I placed one order for our household items (bathroom stuff, diapers, wipes, cleaners, etc.) that would be delivered to our door. Next, I placed on Walmart Delivery order for all of our non-perishable food items (canned goods, peanut butter, flours, etc.). Lastly, I placed one order for our Walmart grocery pickup, which is the haul listed above, for everything that I could not get delivered to the door. As you’ll see listed below, I got a little off since I’m new at all this ordering, deliveries, and pickups. There were a few items I forgot to add to our household haul. I was able to add those items to our grocery pickup order since I was in a pinch (and yes, still didn’t want to go into a store.) I don’t want always to do this, but I’m glad it was an option. Overall I was thrilled with this first Walmart Grocery Pickup experience, and I will certainly do it again. I’m sure I could have saved $100-$200 in May by just shopping at Aldi. However, I would have had to go in the store, load the cart, unload the cart, pay for everything, bag everything, load the van, drive it home, unload everything, etc. Even with big kid helpers, it can be exhausting. I will gladly save some time and energy at this point. 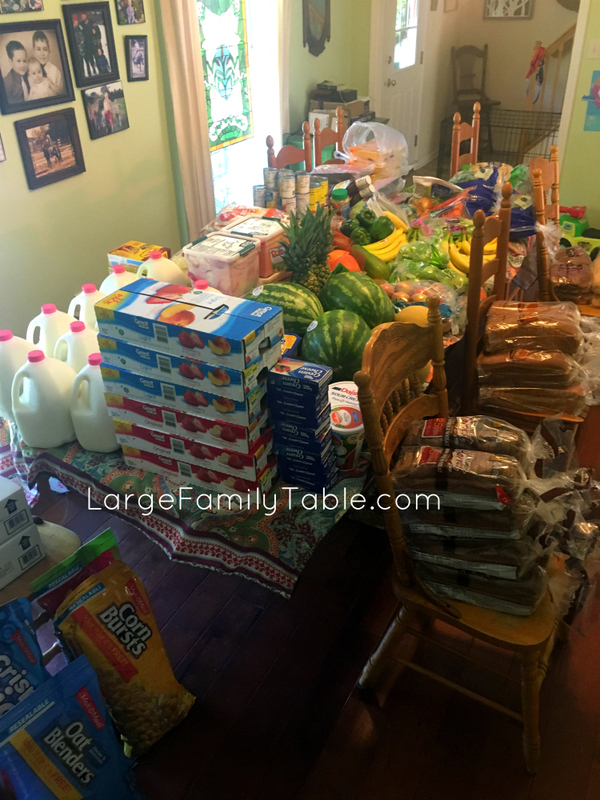 You can click here to watch the full LARGE FAMILY STYLE WALMART GROCERY ORDERING PICKUP HAUL on YouTube! I share the pickup process, a tour of our van, and share everything purchased. Do you have pantry stock and freezer stock to use up now, too? Wow, five dozen eggs for $1.80?!? Was that a special price? I’m also shopping for a large family, and they guzzle milk. Have you frozen the Walmart milk before? Do you have any tips? This is so great! Grocery pick up is seriously amazing! But where do you store everything… I barely can fit one week’s worth of groceries in my fridge! How do yoy keep your veggies/fruit fresh for a whole month? We roll through the fruit/veggies that are more quickly perishable first. So bananas, berries, and grapes need to be eaten first. Apples are usually next. Then other items like those 15 lbs of carrots for instance last many weeks. Here’s how we turn carrots into snacks https://largefamilytable.com/large-family-snacks-how-to-keep-fresh-carrot-sticks-for-days/. We also do a little fill-in haul about two to three weeks in. If we need any fruits/veggies replaced we’d get those at that time. Do you freeze the milk or do you use that much before it expires? I have five children (still young ages 10 – 9mos) and we go through milk fast. I love to buy bulk but always worry about perishables. Also, did WalMart give you a hard time about the quantity?? At this point in life, we go through 12-15 gallons of milk within two weeks. We then go back for a small fill-in haul that also includes more milk. Our kiddos range all the way up to 17, and we serve 90 meals a month and 60+ snacks, so we use it all up. 🙂 Back when our kiddos were 11, and under I could buy enough milk for the month and freeze the difference. If you scroll up a few comments, I gave another commenter details on how I would freeze milk if that’s helpful. Does the Walmart ordering/pickup also include cold/frozen food? I’ve been following your “adventures” for about 5 years (since I started homeschooling). I applaud you for your ability to do all that you do. My husband was recently diagnosed with Hashimoto, and we are re-vamping everything we eat to the Autoimmune Protocol. I was wondering if you could suggest how to do a large family, tight budget, sticking to AIP. If you don’t know personally, but you know other people that might have some suggestions that would be wonderful. 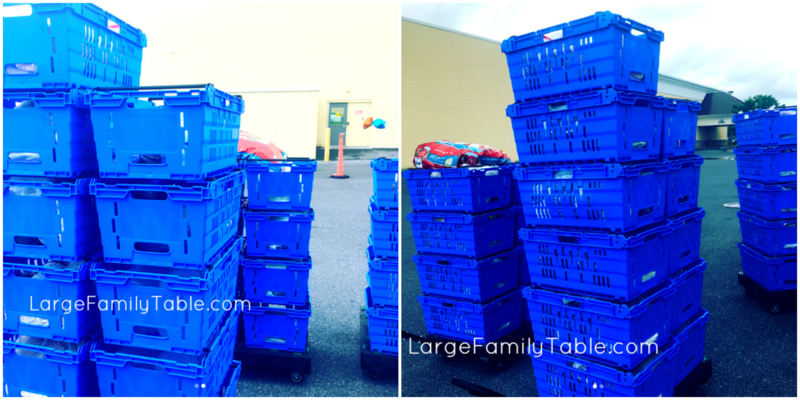 We have been using Walmart grocery pickup for a year now and we LOVE it! It’s kept me out of the grocery store almost completely. It has eliminated waste and impulse buying. We are not a large family but I have big eaters in my house!! This is amazing!! Thannk you for taking the time to post it!! I am curious if you use the walmart receipt scan thing that matches prices for you? I am wondering if it is worth using up valuable app space! I think you can do it on the website as well, maybe. You can use the savings catcher app. I believe I saved about $11 last time.